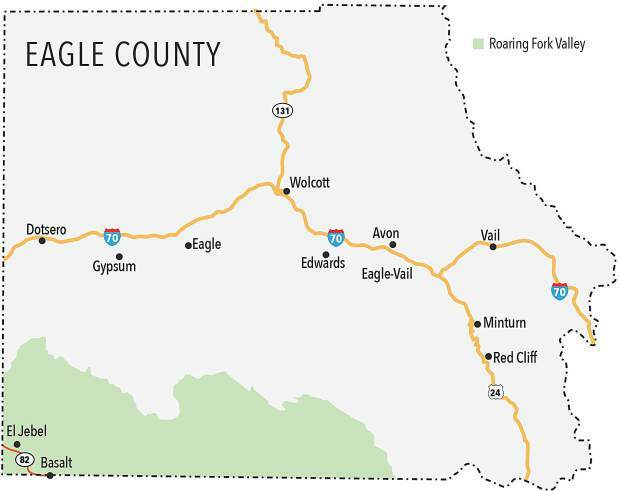 This map shows the "geographic conundrum" as Commissioner Kathy Chandler-Henry described it, of the Basalt/El Jebel area being part of Eagle County. The communities are actually part of the Roaring Fork Valley and can only be accesses from the Eagle River Valley by driving west through Glenwood Canyon, through Glenwood Springs and the southwest on Highway 82 or by traversing Cottonwood Pass, a narrow dirt road. EAGLE — A flat map is about the only place where it makes sense to place Basalt and El Jebel within the confines of Eagle County. Even a topographical map will demonstrate the impracticality of the designation that’s existed for 135 years. The boundary line on the west end of the county, along with the majority of the southern and northern county lines, are as straight as the box that delineates Colorado itself. But in real life, the county’s southwest boundaries are decidedly impractical. The communities of El Jebel and Basalt are located in the Roaring Fork Valley, not the Eagle River Valley like most of Eagle County. The easiest way to reach this part of the county is to drive west through Glenwood Canyon and then pass through Glenwood Springs and head southeast on State Highway 82. This geographic issue has been debated for decades, most recently on Tuesday, July 31, before the Eagle County commissioners, when a delegation from the Basalt and El Jebel area asked the county to bring a referendum to the voters this fall to see if there is support to change boundaries and have their part of southwestern Eagle County placed in Pitkin County. “We are bringing up an issue that is brought up every 10 years, honestly,” said Michael McVoy, one of the Roaring Fork Valley residents proposing the vote. He suggested it’s time to determine the issue, once and for all. McVoy noted that the residents of Basalt and El Jebel already identify more with Pitkin County than with Eagle County. The area’s school district, emergency services and transportation system are all separate from the entities that serve the rest of Eagle County, he said. McVoy made three requests. 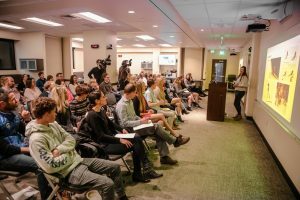 He asked that Eagle County place the issue on the ballot this fall, that Eagle and Pitkin counties open a dialogue about the issue and that county staff help gather information needed for financial and general analysis of the proposal. But the issue of removing the Basalt and El Jebel communities from Eagle County never really goes away, Whitsitt said. By presenting a referendum, she said the debate could finally be decided. “We are at a point where just let us vote,” Basalt Town Council member Jennifer Riffle said. But according to Eagle County officials, it isn’t that easy. “It it my opinion you cannot put this on the ballot,” Eagle County attorney Bryan Treu said. He based that assertion on a state statute which dates back to 1887 and outlines the process for changing county boundaries. That process is daunting. It would require gathering petition signatures in support of the proposal from a majority of the taxpayers residing in the affected area. In other words, more than 50 percent of the taxpayers in the Basalt and El Jebel would have to sign a petition for the process to begin. If that threshold is met, then Eagle County would be required to schedule an election. The Roaring Fork Valley contingent noted that in the 130-year history of the statute, it has never been invoked to change county boundaries. “This is undoubtedly due to the onerous petition requirement,” said Tim Whitsitt, in a memo to the county commissioners. Whitsitt further argued that the commissioners have broad referendum powers and could choose to bring the issue to the voters. “We are still stuck with this statute. It’s a statute that is on the books, and just because it is old doesn’t mean it isn’t applicable,” Treu said. The three county commissioners sided with their attorney. While residents in Basalt and El Jebel may identify more with Roaring Fork Valley neighbors in Pitkin County, Ryan said Eagle County is committed to providing services to the community. She noted that financially, it costs more to provide services to the area than the county recoups in tax revenues. “But the Roaring Fork Valley is just as important to us as any part of Eagle County,” Ryan said. 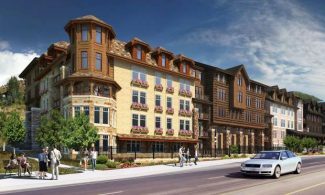 She noted that the group’s appeal was to let the voices of Eagle County citizens living in the Roaring Fork Valley be heard. But McQueeney said taking the issue to countywide referendum would actually drown out those voices. “The right thing to do is to have the people who live in that part of the county decide, and they can decide that through the petition process,” she said. 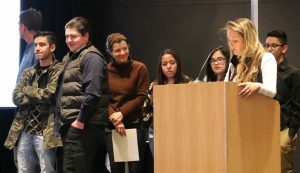 Treu noted the petition process would allow the Board of County Commissioners to determine whether the majority of Roaring Fork citizens, rather than a vocal minority, want to bring the issue to a vote. 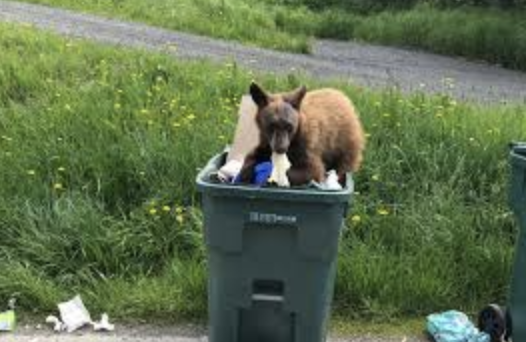 “The Roaring Fork citizens are the most affected, and the petition process is the only way for their voices to be heard. Once on the ballot, it will be Pitkin County citizens and Eagle County citizens residing outside of the Roaring Fork Valley who will decide the fate of the question. Bypassing the petition process is not letting the voters decide. It is letting voters outside the Roaring Fork Valley decide,” Treu said. Commissioner Kathy Chandler-Henry agreed that the county would be acting outside state statute if it agreed to place a referendum on the ballot. The petition process is the lawful process to pursue the issue, she said.